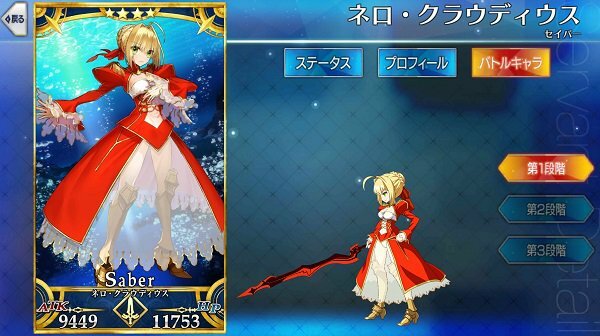 This article contains the stats, strategy, and guide for Saber - Nero Claudius. We will update this as soon as the game comes out. This article contains the skills, stats, growth, and ability of Nero Claudius of the Saber class from Fate Grand Order [FGO]. A durable saber class servant due to the presence of several self-recovery Skills. Similar to Saber Alter, she boasts high offense as well as defense whenever Imperial Privilege chance buffs succeed. Having an Arts-type NP alongside her frequent Arts Card draws, she has the capability to extend Arts Chains decently. She can function separate from the team through the availability of HP-recovery skills. Nero Claudius’ Noble Phantasm is notable for bypassing enemies’ Defense. Whenever there is Overcharge, it provides a Defense drop to enemies. Execute a Brave Chain on the succeeding turn in order to deal immense damage. Reinforce Thrice-Setting Sun to maximize its use in combat. This shortens the CT by 2 points from the base level. Pair her with Hans Christian Andersen to further promote HP growth and chain Arts Cards. Given her Command Card draws and NP’s nature, Formal Craft extends its effectiveness by a generous amount of 25~30%. This enables Nero Claudius to reap the most benefits from chaining Arts either by repeatedly drawing her own Arts Cards in a row, or combining them with other allies. Projection is another suitable CE that grants a similar function albeit with a lower boost in effectiveness. Magic Resistance C Increases own resistance to debuffs by 15%. Increases own mental debuff resistance for 3 turns. 60% Chance of increasing own attack for 3 turns. 60% Chance of increasing own defense for 3 turns. Thrice-Setting Sun A 5 7 Grants self guts status for 5 turns, 3 times. Deals damage that ignores defense to all enemies. Reduces the defense of all enemies for 1 turn. Nero Claudius, also known as the Fifth Emperor of Rome, loves the arts. She loves anything that is beautiful – handsome men, cute boys, and pretty girls. In fact, she considers herself a work of art. Despite her selfish and supremacist ways, people loved her for her childish nature. Due for Nero’s love in the arts, she often indulges herself in watching the opera. She often practices singing, inflicting nightmares on those who hear her song. However, her oppression towards Christians make her appear as if she were a tyrant. In Biblical references, she is the one who bears the number 666.